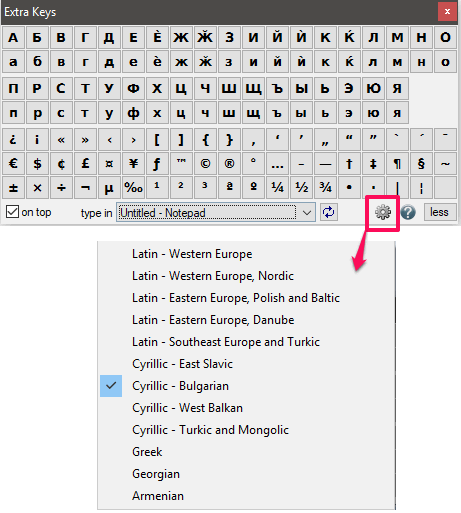 Extra Keys is a free software to type foreign accents, characters in any application. The software comes with a virtual keyboard and has many special characters from different languages. 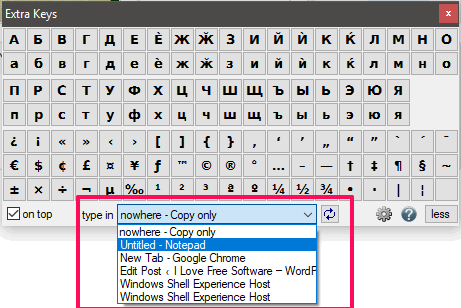 It contains characters from east Slavic, Bulgarian, Latin and many other languages that you can type in any running application like notepad, browser, etc. It lets you choose a target application in which you want to type the desired character or you can also opt to copy the character you click to clipboard. The virtual keyboard of Extra Keys is a very simple one and all you have to do is click on the character key that you want to type. If you want, you can opt to keep the virtual keyboard on the top. There is a drop down available on the virtual keyboard where it shows the running application in which you can type the text from it. Switching between the different languages is easy when you are using this software. There are a lot of special characters available in the built-in character map of Windows and there are some online services available to do the same. But, if you want some more additional characters or accents, then Extra Keys freeware will come in handy. 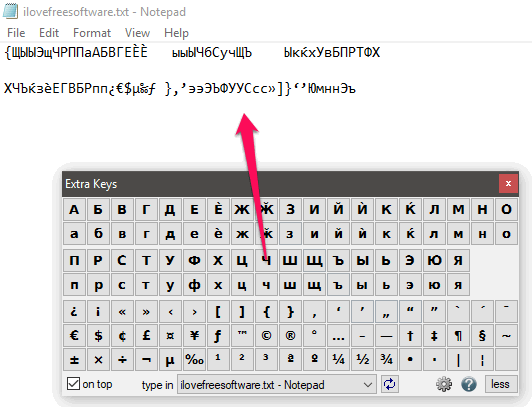 Extra Keys is a very simple to use software which lets you type foreign accents, characters. There is no complicated process of using this freeware. Once you have installed it, it will be very easy to use it. And the very good thing about this software is that you can selectively choose an application in which you want to type. It is helpful as it won’t mess up with the existing application if you lose focus on the main one in which you were typing. Here are few steps to use Extra Keys freeware. Step 1: Download Extra Keys from its main website. After that, install it and run it. You will see its icon in the system tray of Windows. Step 2: Click on its icon from the system tray. Its interface will now pop-up. You can use the drop down from the bottom of its interface to choose the application in which you want to type. If you want to switch to other language, then simply click on the gear icon to do that. Step 3: Now, after choosing the application and language, you can start typing by clicking on the keys of the virtual keyboard. As you click on the key of the virtual keyboard, corresponding keys will appear in the target application. See the below screenshot. In this way you can easily type foreign accents, characters in any application. And Extra Keys freeware makes it pretty simple to do that. Virtual keyboard that it comes with is very handy and you can easily use it to type any letter you want. Extra Keys is very nice software which lets you type foreign accents, characters. And I really like the fact about this software that you can choose in which application you want to type. So, if you are looking for a free tool to do the same, then above article will help you.